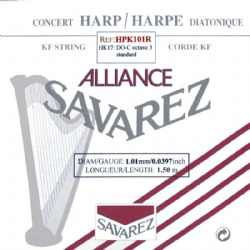 Savarez Alliance KF Carbon Lever Gauge Harp Strings. This Lever Gauge Carbon (used on Camac lever harps) will give a similar string tension to Lever Gauge gut. Some players find this gauge of carbon slightly too light in the bass and prefer the 'Norris Light Gauge' which is the same in the treble but heavier in the bass. Prices listed for Full Sets of 24 (1A to 24F) or 26 (1A to 26D) strings include a 10% discount.